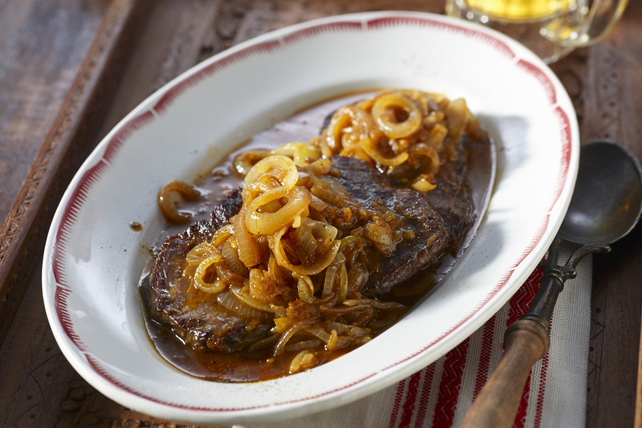 This flavourful Beer-Braised Beef with Onions recipe is oh so easy to make. Prep for 25 min., then place in the oven and let bake for 3 hours. That's it! Serve with hot mashed potatoes and your favourite steamed fresh veggies as part of your next family supper or dinner party. Heat 2 Tbsp. oil in Dutch oven or large deep ovenproof skillet on medium-high heat. Add onions and garlic, cook 6 to 8 min. or until onions are softened, stirring frequently. Remove onion mixture from pan, reserving drippings in pan; reserve onion mixture for later use. Sprinkle pepper evenly onto both sides of meat. Heat remaining oil in Dutch oven. Add meat; cook 2 min. on each side or until evenly browned on both sides. Add beer and bay leaves; cover with lid. Place in oven. Bake 2-1/2 to 3 hours or until meat is done (160ºF). Remove pan from oven. Place Dutch oven on stove-top burner. Combine gravy and reserved onion mixture; pour over meat. Cook, uncovered, on medium heat 3 min. or until gravy mixture is heated. Remove and discard bay leaves before serving the meat with the gravy mixture. Serve with hot mashed potatoes and your favourite steamed fresh vegetable. When serving children, substitute 25%-less-sodium beef broth for the beer.